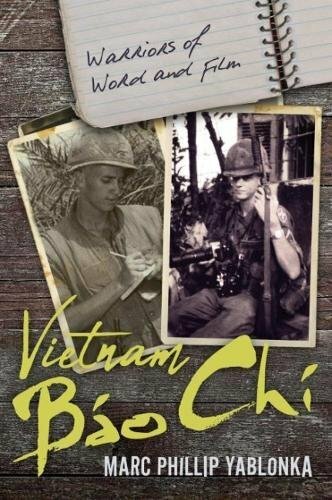 about this book: Vietnam Bao Chi - Warriors of Word and Film (Casemate Publishers-UK and Philadelphia, PA) is about combat correspondents and photographers who served in uniform in Vietnam in all five of the American Armed Forces - Army, Marines, Air Force, Navy and Coast Guard. I was inspired to write the book because, while there is a plethora of books available about and by the civilian press corps who covered the Vietnam War, there were no books out there which dealt with those in the military who wrote the stories or shot the images--both still and "Mopic" (Motion Picture)--of the Vietnam War. I was also inspired to write the book because, while the task of the civilian media was to show the horrors of the Vietnam War, that of the military press was to emphasize the bravery of our troops and the good that they did. Of course, in the course of so doing, they witnessed and recorded the horrors as well! In addition, I wanted to write this book because, unlike the civilian reporters and photographers, whose weapons were their pens, paper, cameras and film, those whose mission it was to write the stories and shoot the film for the military always had to tote a real weapon along with that which they used for their MOS--whether a .45 side arm or an M-16 rifle. And quite often they had to make a split second decision whether to shoot film or their rifles! Vietnam Bao Chi all told took about eight years of research, interviews and writing interwoven with other writing projects and teaching college level English Composition and Creative Writing. It began with two or three articles and evolved into the book it is today. It's title evolved out of email brainstorming sessions between myself and the commissioning editor of Casemate, Ruth Sheppard in the UK. The cover was the creation of Casemate's art department and I heartily and immediately approved of it. As far as the readership of Vietnam Bao Chi (by the way, Bao Chi is Vietnamese for journalism or journalist) is concerned, most definitely scholars and historians of the Vietnam War, Vietnam itself or Indochina should be interested in the book. University students studying the era should as well, whether majoring in history or journalism. Journalists and photojournalists, whether they were in Vietnam or are currently working in the field would definitely be interested in the book. And most definitely military personnel who served in Vietnam or were Vietnam era veterans will likely take an interest in the book--not only Americans, but Australians, Koreans and Thais, all of whose countries sent soldiers to fight in Vietnam. For that matter, French nationals who fought in or remember the 1st Indochina War, which ended in 1954, might possibly wish to read it. What I hope readers of the book get out of it is that there was an entirely different side to the reportage and photography that emanated from the Vietnam War which deserves as much attention and praise as that which came out of what the civilian media sent home. I hope Vietnam Bao Chi - Warriors of Word and Film adds to readers' knowledge of what has been called the most divisive conflict in American history since the American Civil War.